This came to me today through a facebook group that I'm a member of. It is appropriate and now I share it with you. Raminder Singh sent a message to the members of In Memory of Shaheeds Bhai Satwant Singh and Bhai Beant Singh. 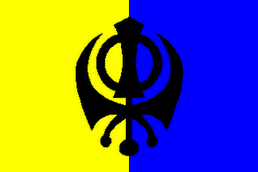 Waheguru Ji Ka Khalsa! Waheguru Ji Ke Fateh! 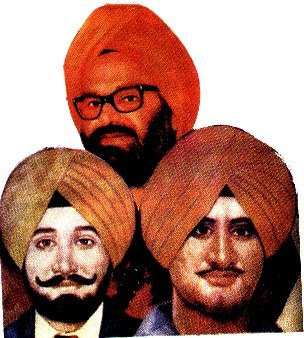 Khalsa ji, twenty four years ago today Bhai Satwant Singh and Bhai Beant Singh along with the help of Bhai Kehar Singh performed a great service to the panth. 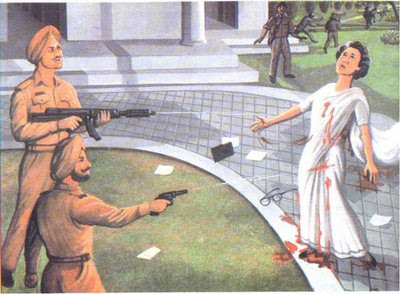 Please take a moment of your time today and remember the services these Singhs did for the panth and their kurbani. 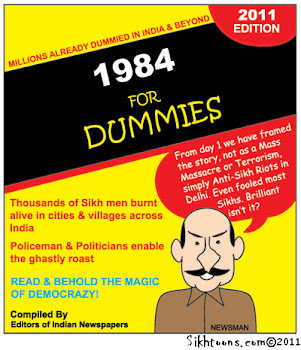 Also do not forget the aftermath and the genocide committed by the Indian state upon the innocent Sikhs in the following days. So go out there and get involved whether its attending a remembrance vigil, donating blood or educating yourself upon the issue, please just do something to remember the events. Our thoughts to them go winging. Yes, today, I am spewing anger and even hatred,venom. By the end of next week, I'll be back to my usual self with a spirit of cooperation and reconciliation and probably some guilt that again this year, I am overcome with these nasty feelings. But honesty demands that I express how I am feeling. So no apologies. Not today, not tomorrow. Maybe in a week. Will check out some of those websites.